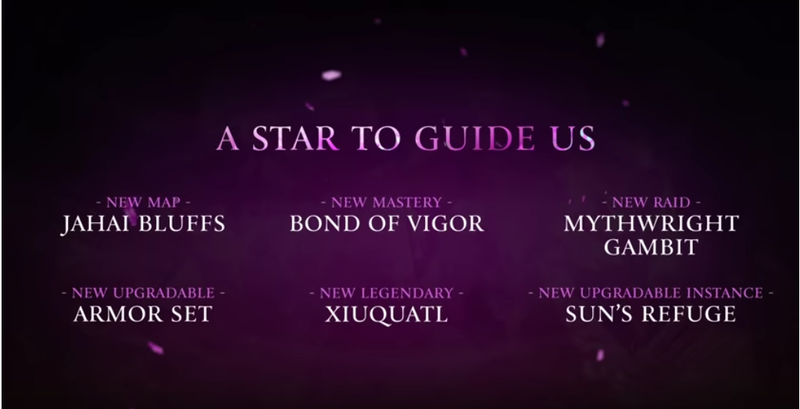 Guild Wars 2 has the honor of being the first MMORPG I have played where I actually groan when I hear there's going to be new content. Specifically, new Living World content. Mostly, though, things have become teeth-grindingly formulaic. It's been getting harder and harder to summon up any enthusiasm let alone excitement. Today I hit an all-time low. Flatlined. There's a new trailer for Season 4 Episode 4, which goes by the name "A Star to Guide Us". It appears to have been designed to send us to sleep. I don't believe I have ever seen a promotional puff with less, um... puff. Composed almost entirely of flashbacks, with one of those voice-over narrations directors like to use when they aren't confident anyone will know what's going on otherwise, the compilation of clips centers on the young dragon, Aurene. Aurene is a cipher at the best of times and her character model gives her the unfortunate appearance of a badly-maintained carnival float. I have always struggled to take her seriously, although she did a pretty good job of changing that at the end of the last episode when she... but, no. Spoilers! Yes, some people still haven't played through Episode 3. I know this to be a fact because one of them is Mrs Bhagpuss. She lost interest in the plot years ago and since she also detests the boss fights she tends to put off doing the instances until the last minute. In the case of Episode 3 the last minute has yet to arrive. I did finish it. It wasn't as bad as some. I thought at the time, though, that I'd had about enough of riding on this roundabout. I no longer have much interest in even exploring the new maps, far less farming them. I think the last one I spent any significant time in was... no, it's gone. Looking on the bright side, there seems to be remarkably little combat in the new trailer. Actually, none at all. I suppose it would be too much to hope for an entire non-combat Episode? That certainly would break the mould. As for the rest of the update, it looks staggeringly uninteresting. There's aforementioned story and map, as per usual. Minus points for making the map Branded - the ugliest visual theme in the game. Then there's a raid. Never going to see that. Don't care. And a new Legendary weapon. Ditto. Oh, and let's not forget a Mastery for Mounts. Or rather, let's. I hate mounts. So far so meh. There are two properly new things but I don't like the look of either of them. What's more, I don't trust them, either. One is an "Upgradable Armor Set". As someone asks at the start of the forum thread on it, "What does this even mean?" I don't know but I'm guessing it's a) grinding and farming and b) wriggle room for ANet over the "no more gear tiers - ever!" promise. If you can't go high, go wide. The other innovation also threatens to scratch an itch, which sounds fine until you remember that scratching just makes you sore and irritated. Sun's Refuge is an "upgradeable instance" modelled on the one in the Nightfall expansion for the original Guild Wars. I didn't like the concept then and I doubt I'm going to like it any better now. It's an annoying, cheap and deeply unsatisfying way to imply the game has housing without actually putting any housing in the game. Much like the existing "personal Instance". Only worse. What with all this "upgrading", the recent revamp of the ArenaNet website and even the World Boss widget in the Gem Shop, I strongly suspect we are being softened up for something. Possibly an expansion announcement, possibly a new game in the franchise (a mobile game, undoubtedly), possibly some kind of app. I could do without all of it. I'm reaching the stage with GW2 where I'm beginning to wonder if I wouldn't actively prefer "maintenance mode". After all, WvW has been in effective stasis for years now and I still play it pretty much every day. If anything, it's most likely going to be the major revamp that finally gets me to stop. And I do my dailies every. single. day. without fail, even though they're the always the same and have been for years. Not just on one account but three! And I do World Bosses regularly even though most of them haven't varied in style or substance for longer than Scarlet's been dead. GW2 has an infinitude of repeatable content already. Some of it competitive, some of it co-operative, some of it solo. Sometimes you have to wonder if we really need any more. The same could be said of many MMORPGs. In the end it's the illusion of change that we chase, anyway. About the only MMO that genuinely rips up the playbook every couple of years is World of Warcraft and the rumbles of discontent over that are growing ever louder. And someone may be listening, because isn't Battle for Azeroth the most "more of the same" expansion yet? Of course, all ANet have to do is release a blisteringly good episode with a fantastically satisfying implementation of all those new ideas, a thrilling narrative, a stunning new map and some amazing gameplay and I'll have to come back next week and eat crow. (Not that I'd ever eat a crow. I love crows). On the other hand, I needed that announcement quite badly. I’ve been getting bored out of my skull in GW2 over the past year; managed to talk my raid group into taking a two week break which will coincidentally end in well timed fashion the week of this Living Story drop, and I’m feeling at least a teeny tiny trickle of interest rekindling. I’m not sure how long it’s going to last, but at least I’m -tentatively- contemplating the potential for playing GW2 at the same rate I’ve been delving into Path of Exile and Warframe lately. 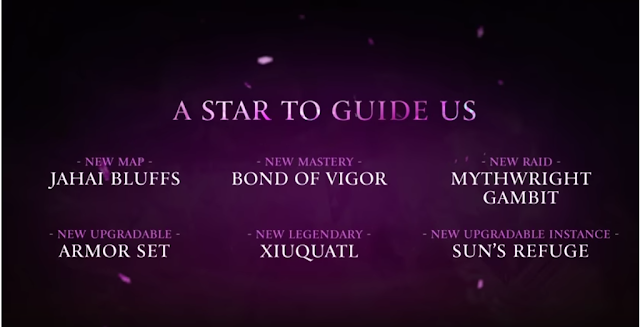 I think I'd be singing a very different tune if ANet were pumping out new content I enjoyed. Sadly they seem to have hit upon a template that meets both their production schedules and the majority of players' expectations. My bad luck I'm in the minority. I also think I've been playing GW2 too long now. It's by far the MMORPG I have played for the longest time without breaks. That's because no other comparable AAA PvE MMORPG has released in the six years since it started. In my first dozen years of playing MMOs that never happend. There was always a new major title at least every 2-3 years and I always moved to it and stayed for a period of months before returning to a former favorite. Since 2012, even when I play other MMOs for good periods of time, I'm fitting that in around my time in GW2. As Anet move ever further from the gameplay and mechanics that drew me to the game in the first place, my time in Tyria becomes less and less rewarding. And yet I still don't see a viable alternative to replace it as my tentpole MMO. 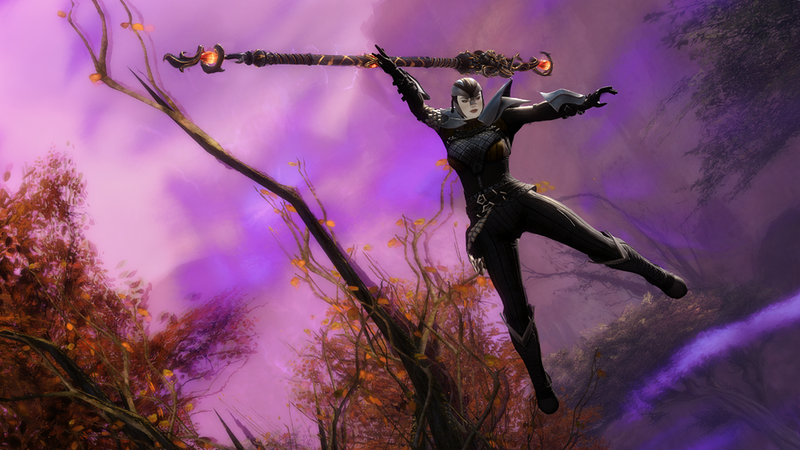 The thing is, GW2 would be a much better fit for my secondary, relaxing, end-of-day MMO. I could play my main MMO and then swap to GW2 for an hour or two just to do dailies and WvW. That would work so much better than the other way around. I wish Brad McQuaid would get a move on.. Since I only played GW2 for about three weeks after release none of the characters and places in those trailers mean anything to me, but even I find the Bug in the System one pretty great and the new one boring. The Living World is one of those things I didn't like about GW2 from the start. If I like a bit of content in an MMO I want to be able to replay it with another character. Not right after the first go, mind, but weeks, months or even years later. It boggles my mind why anyone would spend time and resources to develop content just to throw it all away after a while, never to be played again. You probably missed something, the only unavailable content is the first season. They haven't deleted anything since then. This is a key point of difference for many MMO players. I absolutely love one-off content. I hugely - HUGELY - preferred LS Season 1 to all the following ones, partly because it was just far more involving and interesting but also because it was ephemeral. I especially love genuine be there or miss out content that happens literally only once, at a particular time on a particular day. I completely accept that I will miss most of those events - that's the point. It means when I do manage to atend one it will be a genuine life experience, a memory I will keep forever. That's worth any amount of replayable, instanced convenience. And reading about one-off events i missed is thrilling in itself. Live events and repeatable content in online games are directly analagous to live performances and recordings in real life. Live performance just has something recordings don't. But you need recordings because you can't always be there. It's fine for MMOs to have some permanent content - a lot, in fact - but to make *all* content accessible on demand trivializes the entire process. Unfortunately this seems to be an old-fashioned idea of what an MMORPG should look like. Every MMO that's tried it seems to have regretted it and I don't hold out much hope of seeing it come back into vogue. I get where you're coming from. I guess I get a little too attached to things that I like. I sometimes rather watch a movie I've already seen a dozen times than a new one someone recommended to me but I know nothing about. Thanks for the clarification about the Living World, Mr. Anonymous.